Wholesale Knives. Cheap Discount Prices. Buy Knives in Bulk or Single Knives. 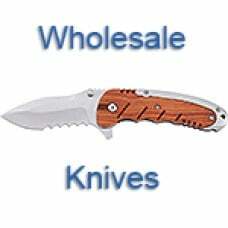 We offer a large selection of wholesale knives. Our most popular knives are pocket knives and hunting knives. Please select from the menu in the left column. As with most of our products, the cheapest knife prices are available with bulk orders. The more you buy of one knife, the cheaper the price will be. We are suppliers for many retailers, but everyone can buy knives from us.